Japanese Episode AG 155: "Startled! Surprised! Elekid!!" American Episode 425: "Reversing the Charges"
Now that Satoshi has his third Frontier Symbol, he aims for the Battle Dome, home of his fourth Frontier Brain challenge. As the young trainer and his friends get on the road, they see an intense lightning storm in the distance. The cause of the storm is revealed to be an angry Elekid, so Satoshi decides to battle it with his Gomazou to calm it down. During the battle, Elekid inadvertently grabs Haruka's egg and runs off with it, prompting the young Coordinator to chase after it. The Rocket-Dan eventually come across the Elekid and grab the egg, but Kojirou's Manene is sent blasting off in the process. As Kojirou worries about the fate of the pokemon he received from Jiiya and Baaya, our heroes come across the area where Manene landed after blasting off. As the two groups continue their search, Takeshi figures out why the Elekid they encountered was so angry; it had built up too much electricity! Satoshi decides to battle the pokemon to enable it to release the pent up energy, so he keeps an eye out for the pokemon as they continue searching for Haruka's egg. Eventually, Satoshi-tachi and the Rocket-Dan reunite and exchange Haruka's egg for Kojirou's Manene before starting to battle. 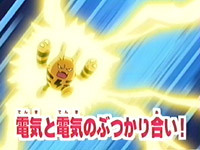 The Rocket-Dan's Golonya mecha is able to absorb electrical attacks, so both Elekid and Pikachu combine their power to short out the robot. Even though the two electric pokemon give it everything they've got, the mecha is still mobile, so Satoshi sends his Gomazou out to finish the job. The little elephant pokemon takes a few hits before it starts to evolved into Donphan! Satoshi's new pokemon makes quick work of the Rocket trio and sends them blasting off again. Now that Elekid has discharged all of its excess energy, our heroes bid it farewell as they continue their journey to Sekichiku City and the Battle Tube. Well, this episode was alright, I guess. There were certainly some good parts, such as the return of Masato's love for being the target of pokemon attacks, something he hasn't had since his very first episode way back in AG 003. I also enjoyed that hilariously awkward moment where Kojirou and Haruka stop everything to swap their pokemon. But there were also some bad parts, such as Takeshi remembering the events of the first AG episode even though he wasn't even there!!! I mean, if he had said something like "Hey Satoshi, remember when you told me about ____," it wouldn't have been a problem at all. But no...in both the Japanese and the English versions, he acts like he was there with Satoshi instead of back home in Nibi City trying to patch things up with his family. The dubbed version is pretty standard, except for one thing: Sarah Natochenny. Now I know you think I'm going to launch into a rant about how terrible she is, but actually...I thought she did a really really good job in this episode. Her acting was much better than it has been in the past, and I only hope she can keep this up for the rest of her time as the character. Everyone else was good as well. Elekid and Donphan keep their Japanese voices. Meowth: "Time for a Poké-chat!" Ugh...was adding Poké really necessary? From the time Gomazou launches its final attack until the Rocket-Dan are sent blasting off, Battle Frontier is heard playing in the background of the Japanese version. This is all replaced by instrumental music in the dub. TO BE CONTINUED... continues to have the video frozen to make the shot last three seconds longer than it was in the Japanese version.